April is National Garden Month! Longer days and warmer temperatures are prompting many area residents to prepare their home gardens and landscapes for the 2019 growing season. It’s also the perfect time to add practices to avoid inefficient watering and/or water waste this spring and summer. “Outdoor water use can account for 50 to 80 percent of home water use in the spring and summer,” said Information/Education Supervisor Carmon McCain with High Plains Underground Water Conservation District (HPWD). 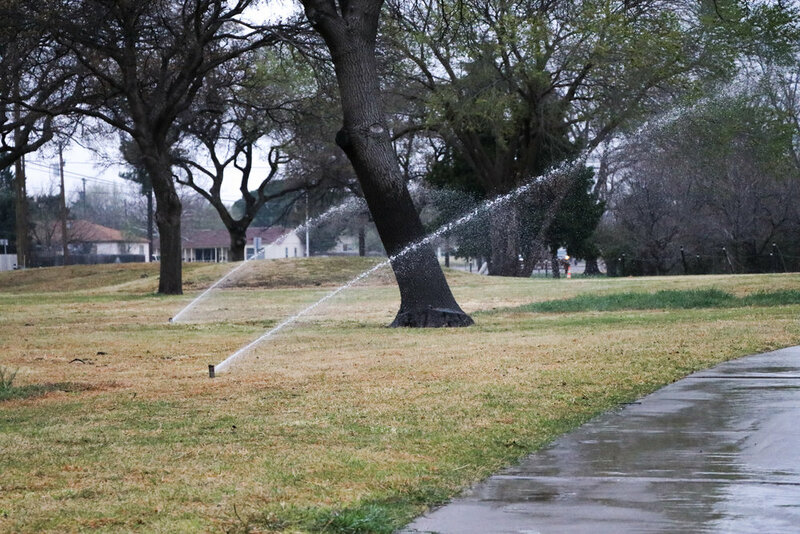 “Because of this, area residents are encouraged to examine their automatic sprinkler systems and repair them as needed to achieve optimum performance this year,” he said. Even the best-designed irrigation system will show signs of wear and tear over time. An annual irrigation system inspection can help save water that may otherwise be wasted. Homeowners should watch their automatic sprinkler system as it operates. Sunken sprinkler heads should pop up easily without being obstructed by vegetation. They should be adjusted to make sure water is not applied to streets, sidewalks, driveways, or other surfaces that allow runoff. Sprinklers should throw a large drop of water -- instead of a fine mist. This reduces the amount of water lost to evaporation and wind drift. Be sure to replace any sprinkler heads damaged by mowing--as well as any broken valves, seals or pipes. Make sure your irrigation system does not apply water to streets, sidewalks, driveways or other surfaces that allow runoff. McCain said it is important to know how much water is being applied by an irrigation system during a given time period. Setting empty cat food/tuna cans or other shallow containers on the lawn is an easy method that homeowners can use to gauge the amount of water their sprinkler applies to the turf. Once the containers are in place, be sure to note the amount of time it takes to deliver one-half inch of water to the lawn. This determines how long to operate the system to deliver the needed amount of water to the landscape. In many instances, irrigation system controllers are initially programmed and then forgotten. Adjusting automatic sprinkler systems in response to changing climatic conditions can help reduce water waste and save money for homeowners and businesses. HPWD encourages persons to contact their local landscaping professional or landscape irrigation specialist for instructions on adjusting controller settings. When irrigating your lawn this spring and summer, please be aware of and comply with landscape watering ordinances your town or city may have in place. “With planning and implementation of proven water conservation methods, homeowners can have a beautiful landscape that conserves the surface and ground water resources of the Texas High Plains,” McCain said. Schedule irrigation systems to run in the early morning hours to avoid evaporation and wind drift.